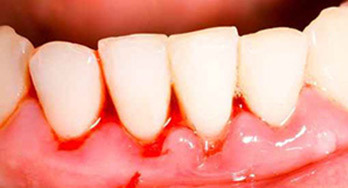 What are the health consequences of gum disease? Research has shown that periodontal disease is associated with several other diseases. For a long time it was thought that bacteria was the factor that linked periodontal disease to other disease in the body; however, more recent research demonstrates that inflammation may be responsible for the association. Therefore, treating inflammation may not only help manage periodontal diseases but may also help with the management of other chronic inflammatory conditions. Gum disease can also make existing heart conditions worse. Patients at risk for infective endocarditis may require antibiotics prior to dental procedures. Additional studies have pointed to a relationship between periodontal disease and stroke. In one study that looked at the relationship of oral infection as a risk factor for stroke, people diagnosed with acute cerebrovascular ischemia were found more likely to have an oral infection when compared to those in the control group.